My first slice of Emotiva DAC coverage appeared nearly two years ago. In 2011, I found the XDA-1 to be a bit of a bargain – US$399 for a (then) better-than-average sound atop a killer feature set: remote controllable digital pre-amp with balance outputs. Back then, very few DACs in the shallow end of the budget market could compete with such a high value proposition. More crucially, the XDA-1 offered a sound that didn’t screech or scratch its nails down the chalkboard despite being solid with detail dig and widescreen musical staging. After teasing with 12 months of trade show demos, the XDA-2 (US$399) finally drops. Ch-ch-ch-changes. Externally the XDA-2 hasn’t changed much from the XDA-1 – the addition of a headphone jack on the very left of the front panel is the only externally visible feature to set the two apart. 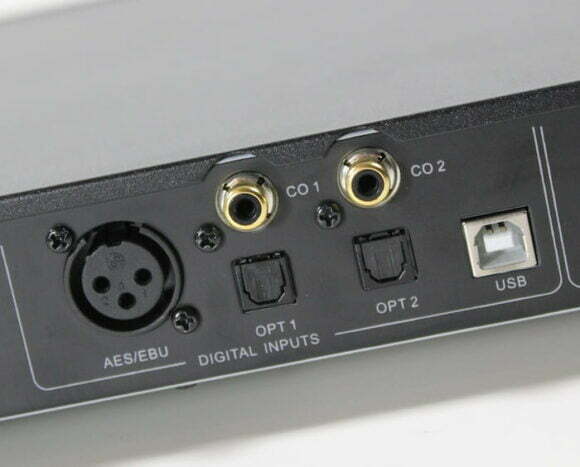 On the rear, a complement of six digital inputs (2 x optical, 2 x coaxial, AES/EBU and USB) as well as balanced and single-ended outputs remain constant. Yes, the analogue circuitry is fully- (and not faux-) balanced. The remote control has seen minor changes in button layout; the addition of an ASRC button alludes to new circuitry under the hood. This is where Emotiva have gone LARGE with improvements and addendums. An Analog Devices AD1955 remains the decoding silicon of choice but they’ve also added an asynchronous sample rate converter (ASRC). When enabled, it resamples all incoming data to 24/96. The aim of the ASRC is to remove more jitter from each of the inputs (not just USB). The ASRC can be enabled and disabled on the fly from the remote control. Neato. What else? 24/192 is now standard across ALL inputs apart from a gotcha on the USB – it won’t do 176.4kHz sample rates. Boo. Still, the USB is UAC2 compliant (no drivers required for Mac, Windows drivers available on the XDA-2 webpage) and it’s asynchronous – a not insignificant specifications leap from the adaptive 16/48 USB of the XDA-1. The XDA-2 has a fully discrete headphone amp that drives all “normal” headphones very well. A 0.1 Ohm output impedance means it can drive standard low and medium impedance headphones comfortably and is quiet enough to sound excellent with IEMs. Emotiva’s representative Keith Levkoff told me that it is powerful enough to drive high-efficiency planars too. They’ve pulled a neat trick with the volume control: The XDA-2 remembers the volume levels you set for the main outputs and the headphones separately. For example: if you plug in your headphones, then turn up the volume, when you unplug your headphones the main volume will return to its previous setting. 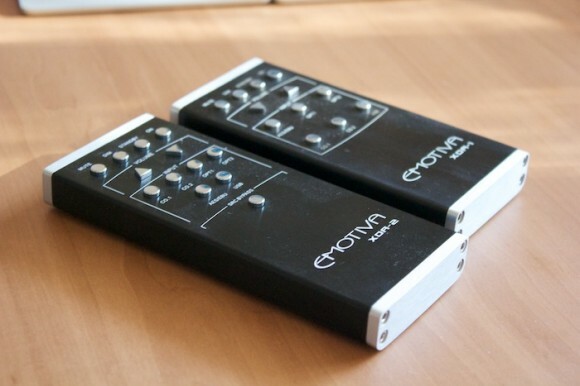 The XDA-1’s volume attenuation was pure digital – I wonder if Emotiva has been listening to its users? The XDA-2 sports a digitally controlled analog resistor ladder volume control, adjustable in 0.25 dB steps. “Unlike most analog volume controls, ours tracks perfectly all the way down to -100dB”, says Levkoff. Great if you plan to connect your DAC directly to a power amp. I didn’t go this route. I conducted my home listening sessions with the Emotiva DAC hooked into the Audio-gd Master 10 integrated and (later) the Peachtree Nova125, each powering Magnepan MMGs. The Emotiva was direct fed USB from a MacMini running Audirvana+. After attenuating the volume level to 0db, the XDA-2’s front display reverts to displaying incoming sample rate. I wish more DACs did this. S-s-s-sound. The XDA-2 sounds bright and breezy with truckloads of air up top. One could perhaps call it somewhat lightweight in its overall presentation. The forward momentum of various cuts from Dan Deacon’s America is eager enough but it’s quite clear when switching over to the Metrum Hex or AURALiC Vega that you’re in the presence of fuller-bodied, more dynamic and richer company. Far more expensive company too. Pushing downstream for a more price commensurate comparison, up popped Resonessence’s Concero (CA$599). An audiophile buddy stopped by to confirm/refute findings. The Emotiva is the brighter sounding of the two units – no question. This lends music a comparatively top-heavy presentation; great for electronic fare but not so awesome for those thinner-sounding 1980s masters. You get the feeling that you’re missing very little from the mix but the Concero offered more conviction below the waist. However – would the XDA-2’s wide-eyed presence get tiring during more extended listening sessions? A question to which the Concero responds immediately. It plays dark chocolate to the Emotiva’s white. The Resonessence sound is comparatively more hooded, smoother up top and tonally meatier. Pete and I both agreed that the XDA-2 shone fluourescent light onto stage players whereas the Concero was murkier, more mysterious…and better for it. We both preferred the latter. The remote-switchable filters of the Concero provided more contrast than switching in-and-out the ASRC on the Emotiva. Another question: how did the XDA-2 compare sonically to the XDA-1? Fortunately, a non-audiophile pal still owns the older model. I trundled across the city with the XDA-2 under one arm. Laurence’s rig consists of the rather delicious Rega Brio-R and ATC SCM 11; both favourites of mine. The digital source was an optically routed MacMini running Audirvana+. A few bars of Bob Dylan’s “Tangled Up In Blue” were all it took to hear again that which I’d noted at home: the inner-illuminating brightness of the newer model. There was that word again: hyper-real. The XDA-2 loads in pallettes of MSG. After servings of Bowie, (more) Dylan and Kraftwerk, switching back to the XDA-1 nudged music’s centre of gravity lower and resolution reveal into the shade. The XDA-2 is a cabriolet version of its predecessor. It peels back the roof (and one’s eyelids!) on detail retrieval. If your system is in need of some pep in the upper frequencies AND is already sufficiently satisfying with acoustic mass then the XDA-2 could be your guy. Its sound when partnered with the beefy Audio-gd amplifier was better than with the Peachtree (which is already sufficiently present in the upper-mids). The MMG’s slightly laid back way with warmth and humidity are more forgiving of Emotiva sheen than when the 47Labs Lens step in – these are mini monitors that demand extreme care when choosing upstream electronics. The Emotiva didn’t sit too comfortably here. I’d imagine most people would buy the XDA-2 for the (super-impressive) feature set alone. This new model will no doubt draw greater interest from headphone users. 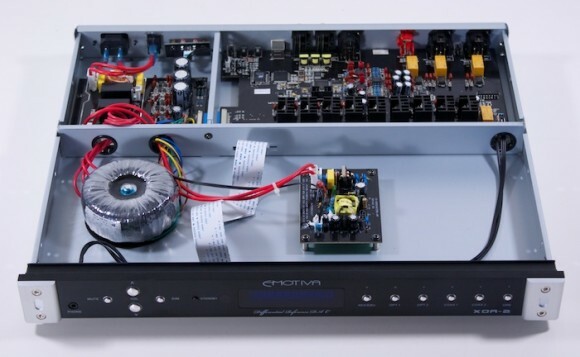 Some buyers will probably pair it with Emotiva’s own power amplifiers (which I’ve not heard). System matching is more critical with this DAC. Personally, I’d add a more buttery tube amplifier — e.g. the Leben CS300/XS — to an XDA-2 fronted system; tonal thickness and a little treble taming (more so than other DACs deployed in this review) would go a long way to ensuring you could have your detail cake AND eat it. 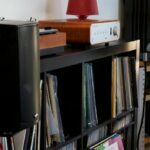 Interesting review John… Its also interesting to see (hear) what directions Emotiva may be going with their gear. I hope they dont succumb to the flashy bling bling crap sound of the past. I have the XPA-2 power amp and I find it extremely ‘well behaved’ in the mid high to highs. It got respect from me right out of the box. No shouty run for cover break in period. The XDA-2 would probably be a good match with this amp. I did an A/B comparison between my Quickie tube preamp and the Schiit Gungnir both driving the XPA-2, using JRiver for the volume control. What the Quickie clearly adds is that mid/mid high tube ‘deliciousness’. A perfect addition IMO. With my MMG’s the tube pre brings the vocals out in front and wide, wheres the Gungnir/Emotiva match the vocals stay behind the speakers and well in the background. 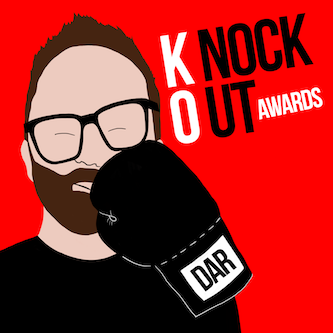 Again – great review – I love your ability to breakdown the ‘voicing’ of a particular brand/piece of kit. Its good info for the rest of us. Thanks for the thoughtful review of the XDA-2. I’m not sure if “brightness” is the word I’d use to characterize it, but I think I know where you’re coming from with that conclusion. I found that adding the ifi iUSB power supply really helped my XDA-2 to “relax”. It smoothed out some of the digital hardness (brightness?) and definitely added low-end body with no loss of the gobs of detail, separation and soundstaging already there. When you consider the bargain price of the XDA-2 to begin with, this combo does a very good job of delivering the goods. Where I think you did a disservice to the XDA-2 was in failing to use its built-in pre-amp. 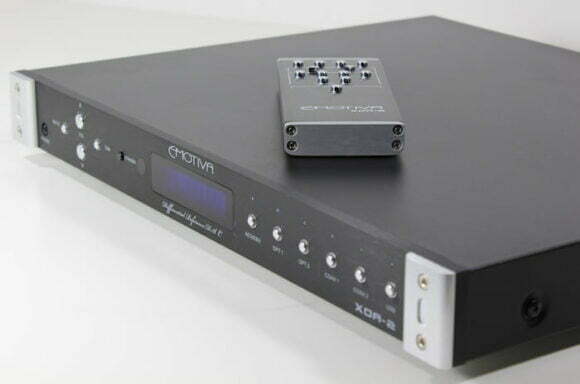 I have the very nice Emotiva XSP-1 pre-amp and expected to always run the XDA-2 through the pre-amp. To my surprise, I’ve found that bypassing the XSP-1 is actually the better way to go. It’s the classic “unveiling” effect, as if a curtain (albeit a thin one) was lifted on the sound when running the DAC direct to the power amp. And with the analog volume control, there is no degradation when volume is reduced. Considering the price, this DAC+pre-amp is a helluva deal. At this stage, I was only testing the XDA-2 as a DAC – specifically, comparing it to its predecessor AND one of my favourite USB DACs (the Concero). I too used a iFi iUSB at home but not at my buddy’s place. The interesting thing is that I heard that high frequency sheen in both (very different systems) and also with other speaker/amp combos (as alluded to in the review). I shall try to give it another run as pre-amp down the line. However, I will say that XDA-2 offers KILLER bang for buck in terms of feature set. Thanks again for a good review John. I’m somewhat intereted in this device, as much for the preamp, remote control and input switching functions as for the DAC I’m currently just using a fiio e17/E09K as a rudimentary DAC/preamp. That feeds a 90w Tamp and old 3 way B & Ws that are already bassss heavy. It sounds better than you might think. 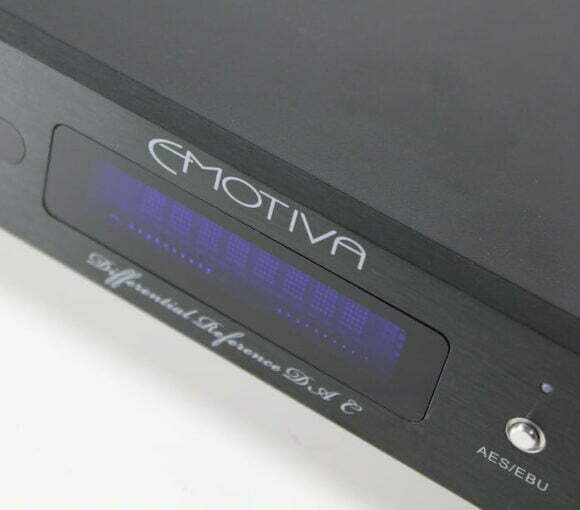 However, the emotiva DAC would almost certainly be a clear upgrade. So, have you had a chance to listen to the preamp and DAC preamp functions rather than just the DAC? No, I didn’t include the pre-amp functionality as part of my review remit. My ‘new’ power amp had yet to arrive by publication time. John, is XDA-2 a good match for Rega Brio R? How does it perform (musically) compared to the Micromega Mydac? Either would be a good match but my $ would go on the MyDAC.